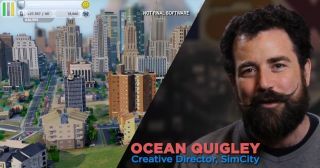 Creative Director Ocean Quigley isn't just the charismatic mayor of mustaches: he's an accomplished artist who's been working on the SimCity series since the '90s. In Maxis' latest developer diary, Quigley narrates a general overview of SimCity's features, showing off some of the customization and simulation detail we've been talking about: the curvy roads; upgradable civic buildings; region play with intercity consequences; simulated resources and data layer visualization; and crime management. You'll also see how the impressively scalable, tilt-shift inspired visuals are coming along. When I spoke to Quigley prior to SimCity's announcement , he described some of the tricks the engine plays to enable consistent framerates in rapidly developing cities. "Interior mapping," for example, creates the illusion of volume inside cars and buildings while keeping the polygon count low. "Previous SimCitys have all been sprite-based games," said Quigley, not counting the non-Maxis SimCity Societies. "Isometric, you know, and you can zoom in on them, but you could never go into them. You could never immerse yourself in the city. "With this SimCity, I wanted to make it so that you could get down into the city. Get a sense of the city engulfing you, and the city surrounding you. We wanted to make sure there was enough detail in those buildings so that when you get down to them and look in, you get this illusion of an interior, you get the details of the bricks, the sculpted façade—stuff that's worth looking at. But we've also had to do this at scale. It's not enough to have a really high polygon model of the power plant and call it a day. We've had to come up with graphic techniques that give you a lots of detail when you're close in, but represent it in such a way that we can have a full city's worth—you know, thousands and thousands." SimCity is scheduled to release March 5, 2013 in North America, and March 8 in Europe. EA is currently offering pre-orders on Origin at its standard prices: $60/£45 for the Limited Edition, and $80/£65 for the Digital Deluxe Edition.